We got the 7.00 o’clock hotel shuttle to terminal 2 of the Hongqiao airport and got our flight to Guilin. That went smoothly but it was pouring with rain when we landed. How good that we had come prepared! We were duly met by Wun Bin and it quickly turned out that the hotel we had booked was not in Guilin but in Yangshuo about 70 Km south!! Wun Bin arranged for us to go to another hotel and took us there. Cancelling the first one was not so easy so we thought we would have to pay for one night there! But no, there has been no such charge. Wun Bin then took us to Yaoshan – the tallest mountain in the area – where we took a chair lift to the top. It was so misty, not quite so much rain but thick cloud, we could only see one chair ahead of us on the lift. Below us was a toboggan run. The toboggans have small wheels but otherwise it looked much like the ice runs on Königsberg – just made of stainless steel not ice. It was closed. At the top of the hill is a temple and people have tied red prayer tags to some of the trees. 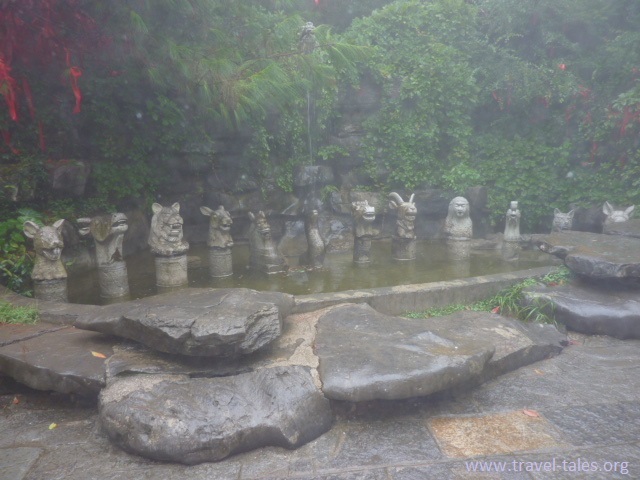 Also there were a number of statues there and a wall depicting the Chinese birth years. 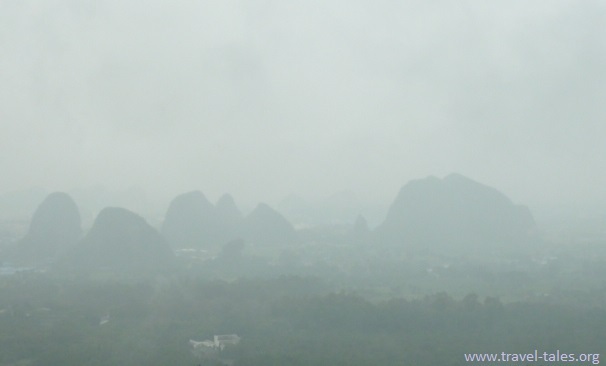 The highest peak is 903.3 meters high and is the highest hill in Guilin. It received its name from a Yao emperor temple, which was built the top of the mountain in the Tang dynasty. The Hill has several places of interest including Yao Temple, White Deer Temple, Jade Breast Pond and Tianci Field.